We often hear the expression “The science is settled,” however, science is a process. The idea that “science” cannot consider new information contradicts the definition of science. People who promote vaccination as an extreme medical ideology are involved in “scientism” - the manipulation of the science surrounding vaccines. And it is certainly “unsettling” to hear the dishonest scientism claims that blare out in all forms of media. “First do no harm” is the concept that underwrites all medical practice. Australian vaccination policy is so poor and damaging, that it beggars belief that legislators can be so close to manufacturer sales objectives as to guarantee them a market through coercive legislation that involves simultaneous removal of patient choice. The evidence supporting vaccine policy failure and its lack of safety is becoming so voluminous that it will eventually destroy the unnatural power alliance that desperately tries to hold it all together. One of the most difficult questions parents can face is: do we vaccinate our children? For some, the answer is immediate; for others, not so. Some parents are confused or mistrusting of the vaccine industry and, in turn, anyone administering their products; while others are first in the queue to ensure that their children get all the recommended shots. Recent events, unfolding globally and reported in the leading medical journals, will not make that decision any easier. Unbeknownst to the general public, an internal war is underway regarding medical research in general and the HPV vaccine in particular. The battle brings to a head familiar themes that many parents, doctors and researchers have been attempting to debate in an honest and open way for decades now but have been prevented from doing so: biased research and cover-up regarding vaccine efficacy and safety. What makes this time different is that the battle is amongst the leading medical researchers in the world, and academic blood is being spilt across the pages of the top tier medical journals. The journey we are about to embark on will be a surprise, maybe a shock, for some of you; for others, you will say under your breath: I told you so. HPV as a cause of cervical cancer is regularly touted across media globally even though it is not definitively proven as causal. Scientifically, the best we can say is that HPV is associated with cervical cancer. The scope of HPV-associated cancer has now been widened to include head and neck cancers in boys, leading to the UK Government, recently, making the HPV vaccine available for boys. We have an HPV vaccine that in some countries is mandated, being used for HPV-associated cancers that not only has HPV not been definitively proven to have caused, but also the vaccine has not been proven to prevent. The evidence we will uncover will shine a much needed light on the mechanisms, largely unknown by the general public and medical community, that brought the HPV vaccine for boys to the attention of the UK government and led to it being implemented in its vaccine schedule. Evidence that, at the very least, reveals significant conflict of interest and heavily biased research. 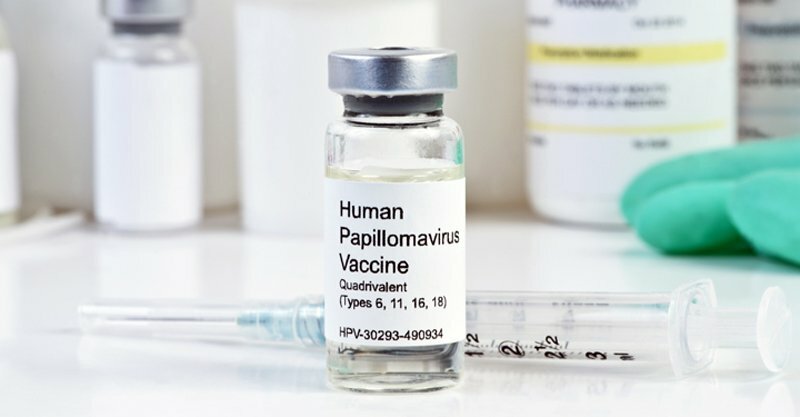 There are also other data that are now emerging that paint a very disturbing picture of this HPV vaccine, one that could have been predicted: an increase in cervical cancer rates and not a prevention of cancer after introduction of the vaccine. We will cover those data in another article. At the centre of any doctor-patient relationship should be trust – trust that both parties are having an honest and open dialogue and that they will work in the best interests of the patient. Those principles are enshrined in national law and more generally as global standards of Human Rights. Specifically, all medical encounters, including the administering of a vaccine, revolve around informed consent. In order that a patient can be fully informed of a medical procedure, the doctor/nurse that is performing the intervention must, in turn, be fully aware of the pros and cons of that procedure. At the time of writing this article, few if any healthcare practitioners know what we are about to discuss. HPV vaccine has had a dark shadow over it for many years now, with significant harms being reported very soon after the first girls were vaccinated to “protect” them from cervical cancer. The medical establishment, pharmaceutical industry, government organisations and advisors to government have attempted to shake-off the cloud, but in doing so have brought upon themselves a storm – a potential Mayake event worthy of any Astrochronologist, a storm that was triggered by the introduction of the HPV vaccine for boys in the UK in July this year. A research paper by the Nordic Centre, part of the global organisation the Cochrane Group, was submitted for publication to the British Medical Journal (BMJ). The Cochrane Group up until this year had a well-deserved reputation for excellence as an independent voice for research, especially one of its global centres – the Nordic Centre, headed-up by Dr. Peter C. Gøtzsche (pictured). The paper from the Nordic Centre, critical of the HPV vaccine, was deserving of publication and promotion in the BMJ to its members who are, effectively, the entire British Medical community. Unbelievably, however, it was blocked from publication and rejected; the UK’s doctors would not get to see it and the information it contained criticising the HPV vaccine. On May 9th of this year, after the rejection of the HPV-critical paper, Arbyn and colleagues, from another centre in the Cochrane Group, published a research paper on the HPV vaccine with one difference, it was pro-vaccine. 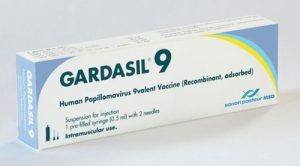 The very day it was published, the BMJ did not attempt to block the information in the paper; in fact, it published a positive article on the paper in its main journal, ensuring that its members got to see that information and were left in no doubt that the HPV vaccine should be promoted to patients across the UK. The timing of the BMJ article (published the same day as the Arbyn paper was released) demonstrated that it was ready to go. This all happened just as calls for the HPV vaccine to be introduced for boys were building and increasing the pressure for the UK government to place it on to the schedule. First: the Arbyn paper was scientifically flawed as it did not cover all available research pertaining to the HPV vaccine; in fact, it did not even look at any data from Gardasil 9, the very vaccine now promoted for boys in the UK and the current iteration of the vaccine predominantly in use globally. 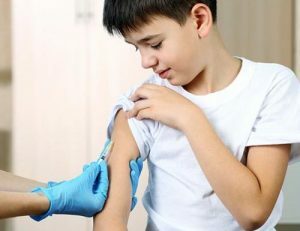 After the UK government had announced that it would include the HPV vaccine for boys in its schedule, the Nordic Centre eventually gained publication of a paper critical of the (pro-HPV vaccine) Arbyn paper. In fact, it was just three days after the UK government had announced the HPV vaccine inclusion in its vaccine schedule that the paper critical of the vaccine was allowed publication. That paper, however, was not promoted to the BMJ members; it was parked to the side in a cadet journal and may have remained hidden there were it not for the actions of two very courageous individuals, Dr David Healy and John Stone, both long term advocates of transparency and honesty in medical research. Dr Healy is a research clinician and Mr Stone is the UK editor for Age of Autism, an online journal primarily concerned with issues pertaining to autism and vaccine safety. The Cochrane human papillomavirus (HPV) vaccine review [Arbyn’s paper] missed nearly half of the eligible trials. The Cochrane systematic review [Arbyn pro-HPV vaccine paper] is biased and incomplete, probably due to financial conflict of interest. Most of the 14 Cochrane authors on the first published protocol for the Cochrane review had major conflicts of interest related to the HPV vaccine manufacturers. The Cochrane review only has four authors, three of whom had such conflicts of interest a decade ago. The review’s first author currently leads EMA’s ‘post-marketing surveillance of HPV vaccination effects in non-Nordic member states of the European Union’, which is funded by Sanofi-Pasteur-MSD that was the co-manufacturer of Gardasil. 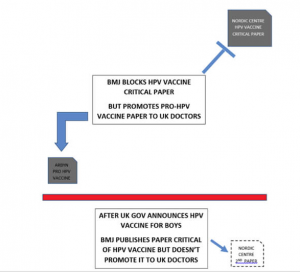 The BMJ’s actions in initially preventing publication in its main journal of the Nordic Centre’s research critical of the HPV vaccine; and then promoting a flawed paper that was positive about the vaccine, while all the time being aware of the Nordic Centre’s critical data; and then after the vaccine had been accepted and put on the UK vaccine schedule, only then publishing a critical paper of the HPV vaccine but not promoting that paper (rather, choosing to park it to the side) were rightly alarming to Dr Healy and John Stone. They both quickly pointed out what to any reasonable person seemed just not right. But the story didn’t end there. Dr Healy and John Stone’s exposé of the story resulted in an internal Cochrane enquiry that eventually revealed nothing to see here; move along – effectively, all the appearance of a “whitewash”. But a head had to roll: was it to be the author of the flawed paper promoting the HPV vaccine? No, it was the man that challenged it, Dr. Gøtzsche from the Nordic Centre. Yes, the internationally recognised expert in medical research and author of a leading clinical medicine text was to be sacrificed and publicly shamed after daring to criticise flawed, pro-vaccine research. 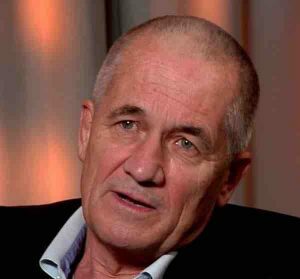 Dr Gøtzsche was removed from his position on the board of the Cochrane Group. Some of you may be saying to yourself, we’ve seen this before: leading, well respected expert criticises vaccines; leading, well respected expert is gone. The ‘suggested’ resignation of another four members of the Board [which] was a well-planned, pre-determined operation for the elimination of all the critical voices form the Governing Board [also took place]. This time, there has been a seismic change. Things haven’t quite gone to plan, and instead of other prominent experts hiding and distancing themselves from Dr. Gøtzsche, the “convicted criminal”, they are standing up for him and standing up for science: honest, transparent science! We now have the most senior medical professionals involved in research and publishing that research, in battle with what some consider the hidden hand of the pharmaceutical cabal. A battle the likes of which we have never seen before. The fight back has begun and now the author of the pro-HPV vaccine paper, Arbyn, is being investigated for undeclared conflicts of interest. Will the power and influence of the pharmaceutical industry win the day, or will honest, scientific research prevail? I think more to the point: will we sit on the sidelines and watch while the few fight the many for the future of our children by exposing Pharma bias and fraud, or do we support them by writing to our MPs, government officials and newspapers demanding transparency in all areas of healthcare and, in particular, transparency in vaccine research. Never has there been a better time to join the fight! Original article published by CHD with permission from the Liberty Beacon. i2P Editor’s Note: Tenaciously, Elizabeth Hart has succeeded in turning on the light to many issues involving unethical marketing processes surrounding vaccines. The following link illustrates some of the pertinent questions she has asked and had published in the BMJ. “The BMJ has also published another rapid response by me on Peter Doshi’s Pandemrix article, i.e. At least we’re getting the opportunity to put this citizen’s point of view on The BMJ, unlike in Australia where questioning of vaccination policy is stifled. JANE MCCREDIEIssue 39 / 8 October 2018A storm of controversy erupted back in 2016 when the University of Wollongong granted a Doctorate in Philosophy to antivaccination campaigner Judith Wilyman for a thesis entitled A critical examination of the Australian Government’s rationale for its vaccination policy. The humanities thesis alleged, among other things, various underhand shenanigans by the pharmaceutical industry and global and Australian regulators while making multiple claims about harmful effects of vaccines, including resurrection of the long-discredited link between vaccines and autism. It was primarily supervised by professor of cultural studies Brian Martin with the assistance of a colleague from sociology, without any apparent scientific oversight. The thesis was widely claimed to have misrepresented the evidence on immunisation, as scientists and clinicians around the country rallied to defend the practice and criticise the granting of the PhD. Academic sanction of unscientific claims can have long-lasting consequences. According to a report in The Australian, within weeks of the PhD being granted, Dr Wilyman was claiming in her newsletter: “This PhD provides evidence that [not all vaccines are safe] and effective and that the combined schedule of vaccines is doing more harm than good in the population through the increase in chronic illness”. Nothing should be beyond scholarly question, not even immunisation, but it’s beyond me how a doctoral thesis written, supervised and examined by scholars in the humanities could claim to have provided that kind of scientific evidence. Last month, The Sydney Morning Herald reported that Dr Wilyman had provided an expert witness statement to the Family Court in a dispute between estranged parents over whether their children should be immunised. Dr Wilyman claimed to be qualified to write the report because she was “an independent person with expertise in public health and the effects of toxins on the human body”. The government had not provided “hard scientific evidence of safety and efficacy of vaccines because it cannot,” her report said. If the father was not able to provide such evidence, and the mother did not wish to vaccinate, “then the default position must be not to vaccinate”. The court may, of course, choose to disregard these “expert” views, relying instead on those of an actual immunisation expert, Professor Peter McIntyre, who has been asked by the children’s father to provide the court with his appraisal of Dr Wilyman’s claims. Professor McIntyre, the former director of the National Centre for Immunisation Research and Surveillance, has previously criticised the awarding of the doctorate to Judith Wilyman. “It is clear from even cursory examination that Wilyman’s thesis, although raising some legitimate questions about gaps in both the process and transparency of immunisation policy development, is based on a highly selective and poorly informed review of the literature, driven by the imperative to support pre-determined conclusions,” he told the Herald. Wollongong University “must bear the major responsibility for manifestly inadequate supervision,” he said. I am not suggesting there is anything intrinsically wrong with a doctoral thesis on immunisation policy being supervised and examined by scholars in the humanities. But when such a thesis draws on the science of immunisation – which it clearly must – somebody needs to be assessing the accuracy and rigour of the scientific analysis provided, during both the supervision and examination process. Dr Wilyman would not be the world’s first doctoral candidate to have approached her work from an entrenched ideological position, but a PhD thesis is not a 100 000-word opinion piece. Like any scholar, she should have been expected to provide quality evidence for her conclusions, evidence that should have been subjected to the most rigorous scrutiny by experts in the field. The consequence of the apparent failure to do that is that Dr Wilyman now has the enhanced platform for her views provided by an academic title and her resulting claim to be an expert in public health. Let’s hope the courts display some scientific rigour in assessing that. A humanities thesis is not a scientific thesis. So should not be transmuted to a scientific opinion. Can be a social opinion but expert scientific opinion . Who takes notice of a Ph.D as denoting an expert?? The thesis tried to point out that there is a conspiracy between doctors, the government, big pharma and the WHO to vaccinate children. The analogy would be arguing there is a conspiracy between aircraft engineers, airlines and the government to make airplanes fly. The idiocy of the argument escaped the examiners of the thesis. When a parent asks, “Can you guarantee me that immunisation is safe”, my standard reply is ” Probably not – but I can guarantee you that NOT immunising is NOT safe.” The psychology could be the unconscious thought that. “If I consent to the injection and something bad happens, that’s my fault; if I don’t agree and something bad happens, that’s God’s will” This is backed up by the belief that the diseases to be prevented are now very rare, but they believe that immunisation complications are common. To suggest that the reason the conditions are now very uncommon, in our society, is because of decades of high levels of immunisation, does not resonate. Through working at Victoria’s infectious disease hospital many years ago, I have seen the often deadly complication of measles, mumps, diphtheria, etc, and as a child in primary school, I saw kids in calipers from polio, also some wearing huge hearing aids because their mother had Rubella in pregnancy,…etc. You will understand then why I struggle to be patient with parents who refuse to consent to immunisations. 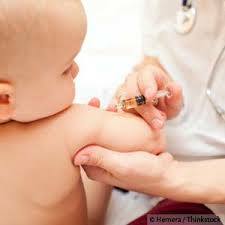 Failing to immunise is child abuse. It should be sanctioned like other abuse. A PhD should not be an opinion piece or New Age ideologies masquerading as science. The University of Wollongong and the supervisors of the PhD should be asked to provide justification for granting it, particularly for not having any scientific scrutiny. It is important that medical writers like Jane McRedie expose this to scientific scrutiny, as she has done here. Send a copy to Brain Martin and the Chancellor of the University of Wollongong.! When you say that Dr Wilyman’s thesis was ‘primarily supervised by professor of cultural studies Brian Martin with the assistance of a colleague from sociology, without any apparent scientific oversight’, it would be fair to also note that Professor Martin’s PhD is in Theoretical Physics from the University of Sydney. One could argue that Brian Martin does not have the right sort of scientific expertise to assess this thesis, but to imply he does not have scientific expertise is incorrect. The problem with medicine is that it has made modern life safe – there is loss of knowledge what happens without scientific medicine. So the public and the politicians think that health is a consumer item – that is why women now want their babies to be delivered in bizarre positions [now that confinement has been made safe ]. No one has seen polio, tetanus, diphtheria, the complications of Rubella – so the public think they have a consumer’s choice just like a supermarket of health choices. There are some very serious gaps in the process and transparency of what should more properly be called ‘vaccination’ policy development, as ‘immunisation’ is so seldom verified. For example, it is a very serious matter that citizens in Australia are often hindered from asking legitimate questions about taxpayer-funded vaccination policy, and that discussion on this subject is often censored. Jefferson’s bald reference to those “who are ideologically opposed to vaccines and their use”, discounts the legitimate concerns of citizens who are alarmed at rapidly increasing vaccination schedules and the arguable over-use of vaccine products. Vaccination policy is a serious political issue in our liberal democracies, and citizens are entitled to transparency and accountability for taxpayer-funded vaccination schedules. In my experience of questioning vaccination policy, it’s the protagonists who seem to be ideologically driven, treating ‘vaccination’ as a religion that must not be questioned, and refusing to be accountable for individual vaccine products. Vaccine products are added without any consultation with the community, and are even being mandated by governments in countries such as Australia, the United States and Italy. It’s astonishing that the move towards mandating the medical intervention of vaccination, and the deleterious impact on the right to ‘informed consent’, has had such little critical analysis. Associate Professor in International Criminology Paddy Rawlinson is one of the few academics to tackle this subject, in her essay Immunity and Impunity: Corruption in the State-Pharma Nexus. Transparency and accountability for vaccination policy is seriously lacking. For instance, we need open examination of the committees and groups influencing vaccination policy, including conflicts of interest of participants. The current crisis at Cochrane highlights even further serious problems with conflicts of interest in evaluating medical products, e.g. HPV vaccines. We need to seriously look at the quality and objectivity of the data underpinning the effectiveness and safety of the ever-increasing number of vaccine products and revaccinations on vaccination schedules. We desperately need truly independent and objective evaluation of vaccine products. It’s extremely difficult for citizens to gain accountability for vaccination policy, with politicians and vaccination bureaucrats blatantly ignoring citizens’ concerns on this matter. It’s also difficult to raise this issue on public forums, where the threat of censorship hovers constantly, and where people hiding behind pseudonyms often try and sabotage debate on mainstream media platforms. Meanwhile, more and more lucrative vaccine products and revaccinations are being added to international schedules. We have no idea of the long-term cumulative consequences of this increasing vaccine load. Yes, the desire to prevent disease with a ‘magic bullet’ vaccination is understandable. But problems are emerging, not only with Pandemrix, but also with other vaccines, e.g. the pertussis/whooping cough vaccine[4,] including the pressure for repeated revaccination throughout life with this combination vaccine product. Citizens are entitled to query whether the over-use of vaccine products could be leading to a disaster even greater than those already unfolding with the over-use of antibiotics, opioids, anti-depressants and other medical products. Stop the polarised ‘pro’ / ‘anti’ vaccination war that has hindered scrutiny of the booming international vaccine market, and start having some considered discussion on the proliferation of these products. 1. Tom Jefferson provides his interpretation of David Healy’s response. David Healy did not actually use this specific wording in his rapid response on this article. 2. Paddy Rawlinson. Immunity and Impunity: Corruption in the State-Pharma Nexus. International Journal for Crime, Justice and Social Democracy. Vol 6 No 4 (2017). 4. Resurgence of Whooping Cough May Owe to Vaccine’s Inability to Prevent Infections, posted on BU School of Public Health, 21 September 2017. 5. Six doses of pertussis containing vaccines are ‘recommended’ for children now, plus repeated revaccination of women for every pregnancy, healthcare workers, early childhood educators and carers, travellers etc. See Summary and Recommendations, Pertussis (whooping cough) in The Australian Immunisation Handbook. Why has my comment not been published? Yet another example of the suppression of citizens’ valid concerns about vaccination policy. It’s to be noted that MJA Insight has played a significant role in playing up the polarised ‘pro’ / ‘anti’ vax dichotomy that has worked so well to support vested interests. Please note citizens are demanding a voice on this matter, particularly in Australia which now must be the most oppressive and dangerous country in regards to the destruction of ‘informed consent’ before vaccination. MJA Insight gets a mention. As you know, Fiona Godlee mentions me in her opinion piece, i.e. my reference to a Reuters special report about the problems encountered by researchers who questioned vaccine safety. It’s very useful to have this information published on The BMJ website. Certainly it is difficult to get this sort of exposure for questioning vaccination policy in Australia, where citizens’ concerns about vaccination policy are basically ignored by the medical profession, academia, politicians and the mainstream media. Please circulate this information to your contacts who might be interested, we need to let them know we have a voice outside Australia. Hi All, FYI, please see below an email to Professor Paul Wellings, Vice-Chancellor of the University of Wollongong, the university that granted Judy Wilyman’s PhD. It appears this UOW statement was issued to counter Judy Wilyman’s PhD thesis, which challenges vaccination policy. In the UOW statement these people are described as ‘experts’? Are they ‘experts’ in vaccination and immunisation? I suspect they are not, but they nevertheless use their academic qualifications to promote their ‘argument from authority’. There’s a plethora of ‘doctors’ and ‘professors’ out there pontificating on ‘immunisation’, but do these people even understand there’s a difference between ‘vaccination’ and ‘immunisation’, and that ‘immunisation’ is seldom verified? Are these people qualified to respond to citizens’ concerns about vaccination? It’s time to start challenging these self-appointed ‘experts’. The email below puts these so-called ‘experts’ on notice that vaccination policy is shrouded in conflicts of interest, and they will be held accountable for hindering citizens’ legitimate questioning of taxpayer-funded vaccination policy. The MJA Insight article authored by Jane McCredie states Judy Wilyman’s thesis alleges “among other things, various underhand shenanigans by the pharmaceutical industry and global and Australian regulators while making multiple claims about harmful effects of vaccines, including resurrection of the long-discredited link between vaccines and autism”. Judy Wilyman is not the only person raising concerns about vaccination policy. There are indeed “underhand shenanigans” occurring, for example in the area of conflicts of interest in vaccination policy. I provided information on this matter in my presentation Big Pharma’s hijacking of ‘over’-vaccination policy – Conflicts of interest and lack of transparency and accountability, presented at the citizens’ Sydney Vaccination Conference – The Censorship of the Vaccination Debate in Australia Today, on 30 June 2018. In my presentation I examine the influence of powerful individuals such as Bill Gates and Rupert Murdoch on vaccination policy, and the network of conflicted academics involved in industry-funded vaccine trials who are also influencing vaccination policy, particularly Terry Nolan the former Chair of the Australian Technical Advisory Group on Immunisation (ATAGI), and Robert Booy, the Head of Clinical Research at the National Centre for Immunisation Research and Surveillance. A regular critic of Judy Wilyman is Peter McIntyre, the former director of the National Centre for Immunisation Research and Surveillance (NCIRS). The NCIRS is influential on vaccination policy and also associated with the vaccine industry, e.g. via Robert Booy, who is Head of the NCIRS Clinical Research Group, which “undertakes a mix of investigator-driven and industry-sponsored research”. Robert Booy is also Chairman of the Immunisation Coalition, an industry organisation funded by GlaxoSmithKline, Pfizer, Sanofi Pasteur, Seqirus Australia and others. Robert Booy is also Chairman of the Immunisation Coalition’s Scientific Advisory Committee. The MJA Insight article refers to an article in the Sydney Morning Herald by Kylar Loussikian, a reporter formerly with the Murdoch-owned The Australian newspaper, who has hounded Judy Wilyman for years. It’s notable that neither the MJA Insight nor the SMH article disclosed Peter McIntyre’s conflicts of interest, i.e. the NCIRS’ association with vaccine industry funding, and his own associations with industry, e.g. GSK, Pfizer and Merck, which are inadequately referenced in the Australian Technical Advisory Group on Immuniation (ATAGI) Conflict of Interest Disclosure document, for his role as an ex-officio member. In his SMH article, Loussikan quotes Peter McIntyre who says: “It is clear from even cursory examination that Wilyman’s thesis, although raising some legitimate questions about gaps in both the process and transparency of immunisation policy development, is based on a highly selective and poorly informed review of the literature, driven by the imperative to support pre-determined conclusions”. Has Peter McIntyre ever published a detailed critique of Judy Wilyman’s thesis? It’s about time Peter McIntyre and others were brought to account for their continued ad hominem attacks on Judy Wilyman. Yes, there are indeed some very serious gaps in the process and transparency of what should more properly be called ‘vaccination’ policy development, as ‘immunisation’ is so seldom verified. Outside Australia there is some movement towards acknowledging citizens’ right to speak about vaccination policy. In this regard it is relevant to post the content of my recent rapid response on The BMJ in response to Peter Doshi’s article about the GlaxoSmithKline Pandemrix flu vaccine and narcolepsy. Yes, the desire to prevent disease with a ‘magic bullet’ vaccination is understandable. But problems are emerging, not only with Pandemrix, but also with other vaccines, e.g. the pertussis/whooping cough vaccine, including the pressure for repeated revaccination throughout life with this combination vaccine product. Please note informed citizens are demanding a voice on this matter. ‘Over’-vaccination policy in Australia is a disaster. On the 23 September 2018 the Sydney Morning Herald published an article by Kylar Loussikian that provided derogatory and untruthful information about my academic research and my work as an expert witness in court cases. The journalist made no effort to research this article and he has quoted from an affidavit that is still due to be heard in the Federal Circuit Court in December 2018. Loussikian has provided a description of my PhD as an ‘immunisation conspiracy’. These are his words not mine. My thesis provides extensive evidence of the influence of the pharmaceutical companies in every aspect of vaccine development – from the clinical trials and safety surveillance in the population to the marketing and education of doctors, politicians and the public. This evidence depicts an industry-bias in the underpinning science that governments are using to develop mandatory and coercive vaccination policies. This is not in the public’s interest but Loussikian has chosen not to provide you with the evidence for this statement but rather to dismiss it as an ‘immunisation conspiracy’. Loussikian has also incorrectly described me as a ‘prominent (militant) anti-vaccination activist’. I present my academic research that supports the right for parents to choose how many vaccines they use in their own and their children’s bodies. This makes me someone who has investigated the medical literature and is arguing for choice in vaccination like all other medical procedures based on the scientific-evidence. Kylar Loussikian has falsely stated that the court case was ‘heard before the Federal Circuit Court in Brisbane earlier this year’. This case is not due to be heard until December 2018 yet the journalist has been given a copy of my affidavit and he has quoted from it in the mainstream media. He also states that Professor Peter McIntyre, the former director of the government Immunisation Research and Surveillance Centre (NCIRS) for 17 years, has been drafted to comment on my affidavit in the court proceedings. What Loussikian did not tell his readers was that Peter McIntyre has been drafted into the proceedings out of time. This is a breach of court proceedings. Loussikian has provided false information about my qualifications to speak on the topic of vaccination. Firstly, there was no ‘controversy’ about the awarding of my humanities degree in 2015. My PhD specialises in social medicine (an area of public health) and in 2011 when I started my degree this school was located in the Faculty of Law, Humanities (Social Sciences) and the Arts. The UOW moved public health to the new Faculty of Social Sciences in 2014. Secondly, his claim that I have ‘no academic qualifications in medicine’ is false. My degree specialises in Social Medicine which is the field of medicine that includes the epidemiology of infectious diseases. But this is factually incorrect because Alison Jones has never read my thesis. Her article in which she mentions my research is criticising the right for freedom of speech on public health topics and she has made this criticism without reading my thesis or debating the arguments. In addition, Alison Jones does not have any qualifications in social medicine. Loussikian’s article also does not inform readers that there are many scientists and academics supporting my PhD research on vaccines. He quotes Health Minister, Greg Hunt who is not qualified to criticise my university research on vaccines and he has never read my PhD thesis. Loussikian falsely claims that I was contacted ‘multiple times for this article’. I was away on a long weekend (21 September) and the article was published on Sunday 23 September. The first I was aware of the one and only email was on Monday 24 September – after the article was published. He describes the supervision of my PhD as ‘manifestly inadequate supervision’. This is untruthful and it is an unsupported smear on the integrity and dedication of UOW Emeritus Professor Brian Martin. If it was true UOW would not be standing by my thesis. If Peter McIntyre had read my thesis he would know that it is about the ‘undone science’ in government vaccination policies and not a selective review of the literature and this is what Peter McIntyre and the government do not want the public to know. See Chapter 8 for the undone science that Professor McIntyre is hiding with his false and misleading comments about my university research and my supervisor. This lie is easily exposed because there is no UOW academic who has read this PhD thesis and debated the scientific arguments that are presented in it. It is of serious concern that Professor Peter McIntyre is making these false statements in the mainstream media about an expert witness report that is still to be heard in the Federal Circuit Court. It is also a breach of proceedings that the journalist, Kylar Loussikian is quoting directly from this affidavit that is still before the courts. The public should be asking why Professor Peter McIntyre, an advisor on government vaccination boards for 17+ years, is going to such lengths to taint the evidence in an affidavit before it is heard in the court. If you wish to understand these actions I would recommend that you read Chapter 8 of my PhD thesis. PhD in The Science and Politics of the Australian Government’s Vaccination Program, UOW School of Humanities and Social Inquiry.